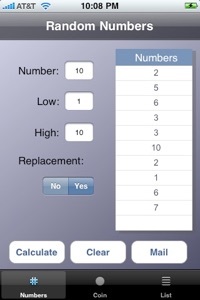 Rand-o-Matic is an application which provides decision support services related to the generation of random numbers. Three separate services are provided in separate iPhone tabs. 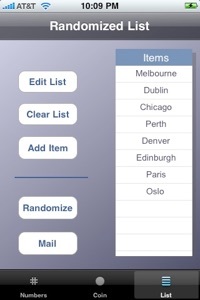 The first tab allows the user to generate a list of random numbers. The user may select the upper and lower limit of the numbers to generate, as well as the quantity of numbers desired. The user may also choose to allow duplicates ("with replacement") and not to allow them. Any list of random numbers may be mailed to any email address. 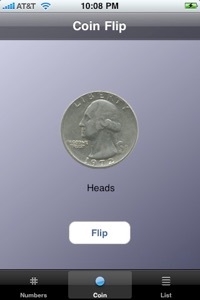 The second tab allows the user to make a "heads" or "tails" decision by flipping an on-screen coin. The third tab allows the user to create or edit a list of text items. Once created, a random order of items on the list may be created by clicking a "Randomize" button. Any list of items may be mailed to any email address.